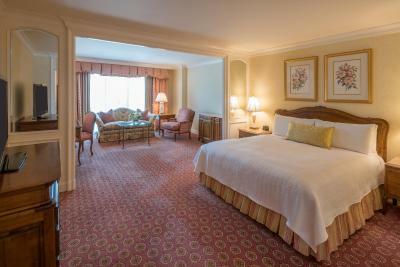 Lock in a great price for Grand America Hotel – rated 9.3 by recent guests! The room was amazing and the staff was great, my friend and I got an upgrade and I can only say it was a shame that I only spent a day there because everything was incredible. speakman shower heads are best in the world. Massage was great! Staff was awesome. Remember when you were a kid and when you thought of staying at a hotel you thought it would be amazing, nicer accommodations than home, super fancy, a really incredible experience? And then your parents took you to a hotel and it completely sucked. The bed was hard, the carpet was scratchy and you missed home. Well this hotel is like the one you envisioned when you were a kid. The nicest carpets, beds, bathrooms, rooms, lobby, restaurants, staff, etc. There’s classical music in the hallways, the turn down your bed at night and leave chocolates on your pillows, they have a walk in closet/changing area in the bathroom, everything is wood paneled like in fancy Victorian movies, marbled and lush. They have afternoon tea and gorgeous grounds. 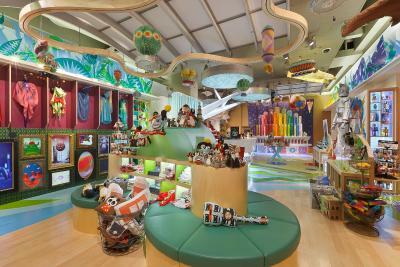 This my friends is the hotel of dreams! It was amazing and worth every penny! Great elegant hotel, I would recommend this place to everyone! The decor and ambiance was wonderful. The pool was beautiful and the shops were fantastic. The hotel even gave complementary gifts from their toy store. It was clean and overall a very luxurious experience. It’s absolutely gorgeous. This place makes you feel like a Queen for a day. 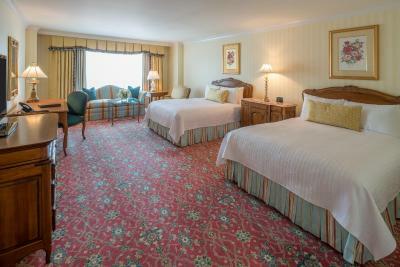 Very romantic setting, Large room and sitting area and wonderful bathroom/amenities. The spa was amazing and the massage we got was out of this world! Holiday time and the Grand Hotel was just that........GRAND !! 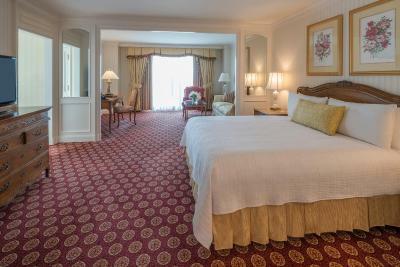 Grand America Hotel This rating is a reflection of how the property compares to the industry standard when it comes to price, facilities and services available. It's based on a self-evaluation by the property. Use this rating to help choose your stay! 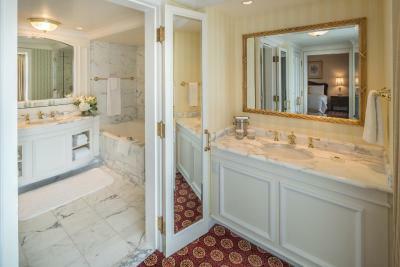 Grand America Hotel rooms include bathrobes, slippers and marble bathroom. 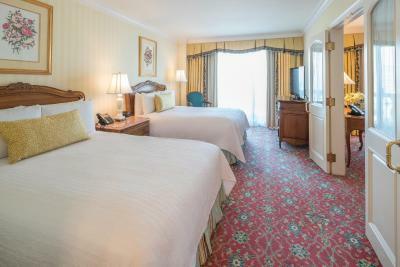 The rooms also feature 24-hour room service and a balcony. Guests at the Grand America can dine in the Garden Café, which features American cuisine. The hotel also offers the Lobby Lounge. The Grand features a tour desk and business center. The hotel also has an indoor pool, outdoor pool and gym. 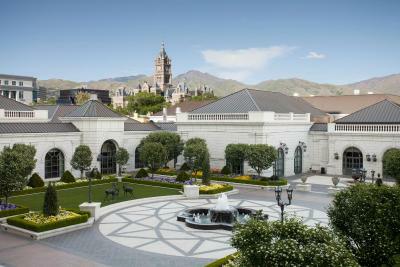 Salt Lake International Airport is 5 minutes' drive from Grand America Hotel. The hotel is 1.2 mi from the Joseph Smith Memorial Building. This property also has one of the top-rated locations in Salt Lake City! Guests are happier about it compared to other properties in the area. 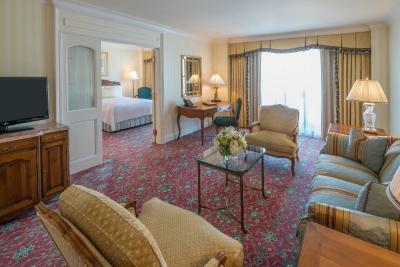 When would you like to stay at Grand America Hotel? 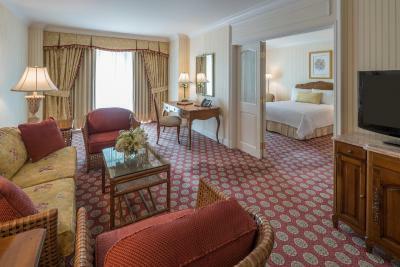 Premium down bedding, English wool carpeting and an private bathroom with marble accents, separate glass walk-in shower and dual sinks are included in this luxurious room. 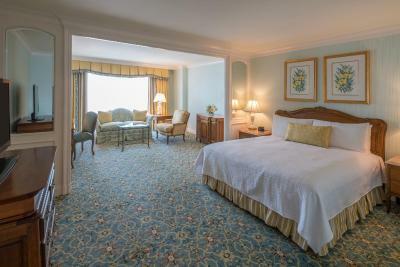 Premium down bedding, English wool carpet, French doors separate the seating area from the the bedroom, floor-to-ceiling windows and free Wi-Fi are included in this luxurious room. 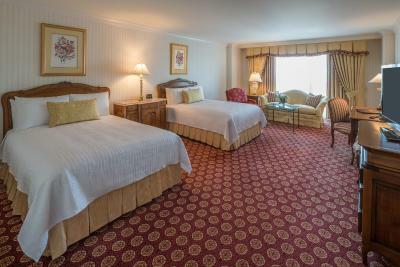 Premium down bedding, English wool carpeting and an private bathroom with marble accents, separate glass walk-in shower and free Wi-Fi are included in this luxurious room. 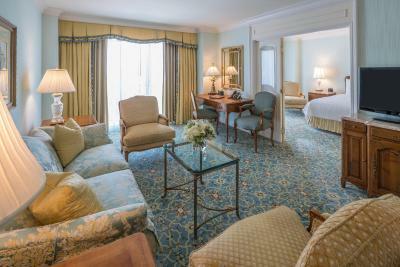 House Rules Grand America Hotel takes special requests – add in the next step! Grand America Hotel accepts these cards and reserves the right to temporarily hold an amount prior to arrival. I like the room the best. The bed was uncomfortable. There were cookie crumbs from previous patrons on the floor. And the doors slamming on floors above and below us were really loud. Our house car mix up almost us our reservations at Ruth Chris's steakhouse. The hotel room was dirty and not maintained.......even the sink's drain stopper was broken. The staff was a bit cold and detached. Additionally it seemed that for such a nice hotel with a larger price tag, they nickel and dime people with parking, daily pool fees, etc. I didn’t love the decor. Our previous room was floral, where as this one was striped.